My best friend, Christine, generously offered (you know…after I asked her 🙂 ) to share her cake pops recipe with us. She started making them last year, and they’ve quickly become her signature dessert. For good reason – not only does she make her cake and frosting from scratch, the cake pops always look beautiful. 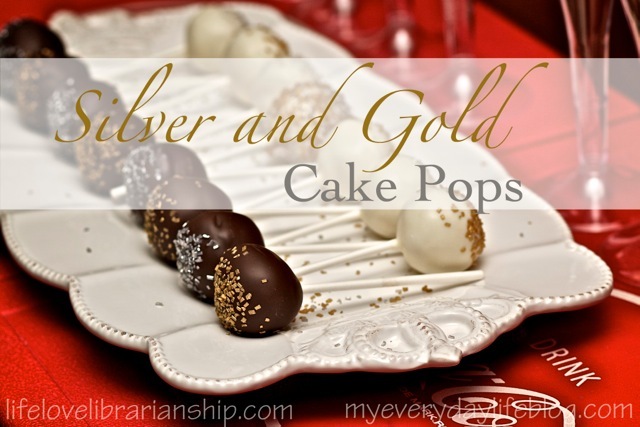 The cake pops below are perfect for your next party. Obviously you can customize them any way you want, but I really like the silver and gold theme…perfect for Christmas or New Year’s. Every time I hear the words “silver and gold” I think of Yukon Cornelius singing “Silver and Gold” durng the claymation version of “Rudolph the Red Nosed Reindeer.” If that doesn’t put you in the Christmas spirit, I don’t know what will. Maybe these cake pops? I must confess that I originally agreed to make some ornament themed cake pops but due to some unforseen circumstances, that just wasn’t possible. But the great thing about cake pops is that once you know how to make the pops themselves, you can decorate them in about three kazillion different ways. So feel free to make Silver and Gold Cake Pops like these or feel free to try your own designs and decorations! Inspiration can be found anywhere and everywhere! Like on Pinterest or from Bakerella (the original queen of cake pops) or even just a good old-fashioned Google search. You could even try and make some to mimic the ornaments on your own tree! 1. Bake two 9-inch round cakes. You can use any cake you like but my favorite is chocolate and the recipe is below. 2. Allow cakes to cool completely on cooling racks. 3. Put cakes into large mixes bowl and tear apart. 🙂 Use your hands to break apart the cakes until they are just cake crumbles. 4. Add approximately 1 can of store bought cake frosting. This is my favorite. 5. Mix the cake and frosting together (I use a wooden spoon) until you get a thick, almost cookie-dough-like consistency. 7. Melt your candy coating of choice in a microwave-safe bowl. 8. Place a lollipop stick into the melted chocolate (about one inch) and then place it into one of the chilled cake balls. Then dip the cake ball in melted chocolate and cover completely. Try to do this fairly quickly so you don’t get too thick of a layer of chocolate on the balls. 10. Place in cake pop drying stand. 1. Preheat oven to 350 degrees F. Grease and flour two nine inch round pans. 2. In large bowl, stir together sugar, flour, cocoa, baking powder, baking soda, and salt. Add eggs, milk, oil, vanilla and mix for 2 minutes on medium speed. Stir in boiling water last. Batter will be thin. Pour evenly into the prepared pans. 3. Bake 30 – 35 minutes in the preheated oven, until a toothpick inserted in the middle of the cake comes out clean. 4. Cool in pans for 10 minutes then remove to a wire rack to cool completely. How many cake pops does this make? It should yield between 30 and 36.